These wooden spectacle frames have been created by Milan designer Matteo Ragni. 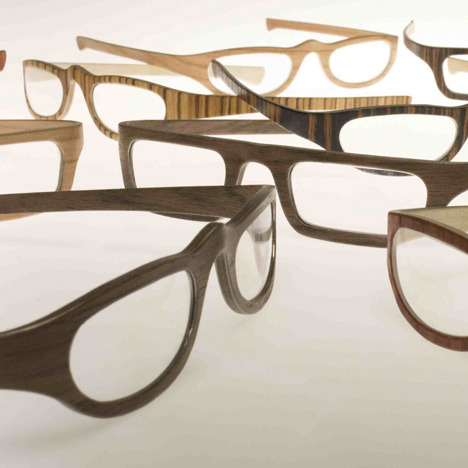 Called W-eye, the reading glasses are made from layers of wood laminated with aluminium. Intended for use at home when reading or watching television, the design is without hinges. Ragni developed the product range with Doriano Mattellone of wood research laboratory MAWOOD. The spectacles are produced in ebony, zebrano, mohagany, cherry, ash and walnut. W-eye represents more than just well designed spectacles, it reflects a tale of encounter. Wood, passion, craftsmanship, attention, research and integrity. W-eye is born from the expert hands of Doriano Mattellone in the MA-wood laboratory, surrounded by the luscious green forests of Friuli, and from the pencil of industrial designer and researcher Matteo Ragni, winner of the prestigious prize “Compasso d’Oro”. This encounter between those who touch, transform and craft the material and those who pursue innovation, each pushing the boundaries in order to transcend convention, has given birth to a collection of indoor spectacles. Technique and research are crucial characteristics of all aspects of the collection: two thin, but resistant aluminium foils, together with multi-layered wood in 6 different forms, represent the soul of these spectacles, giving them flexibility, strength and lightness. Every W-eye pair of spectacles is hand crafted with care and passion, giving them seamless sensibility at the touch. Being hinge free, with high malleability of the arms, a technical choice is reflected that contributes to the even assimilation of the weight of the spectacles and their even redistribution between the nose and the sides of the face. All this guarantees perfect vision and makes them a pleasure to wear. Designed as a response to the demands of ‘close reading’, the collection explores the use of indoor spectacles in the private environment and the relationship to outdoor spectacles for everyday and varying daily scenarios. Although wood and aluminium are intrinsically contrasting materials with distinctive souls, like the creators of W-eye, they reflect an encounter between two different souls with di- verse visions who work together to generate an entirely new perspective.